I just learned about a wonderful initiative called ‘Free Desk Here’. The rules are simple: Agencies around the world offer a free desk in their studio to a new talent. The agency gets to decide who they offer the space to and the duration of their stay. The idea is being supported by the well known graphic artist, Anthony Burrill who designed the limited edition screen-print to accompany the initiative. 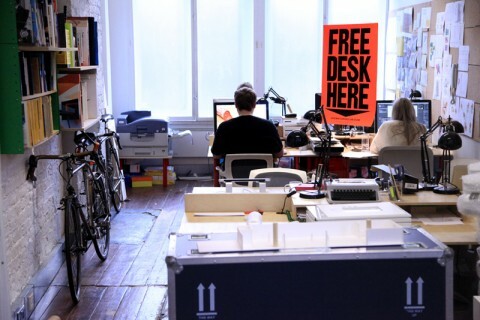 The first 50 studios to list a free desk will receive an Anthony Burrill signed, ‘Free Desk Here’ print. I wish the animation industry was as cool as design industry is…it’s depressing. That’s a great idea! Thanks for posting about it. i hope this spreads across other industries. come in, sit on it and mind your own business… it’s literally just a chair in my living room. I love this idea! Probably will take part. Great idea, all design agencies should be partaking in this. What better way to discover new creative talent!